With long elegant leaves rising up from the bottom, the Large Bird of Paradise is a popular indoor plant for creating that instant jungle atmosphere, and also a go-to statement plant by many interior designers. The Bird of Paradise has bright and striking split leaves that resemble that of a banana tree. It is a resilient plant and with consistent care, will often reward you with fresh new leaves. In maturity and with enough light, the Bird of Paradise will produce these exotic blue-and-white flower, resembling the head of a crane. Follow the instructions below and your Bird of Paradise will thrive by your side for years! All plants experience some shock when moved around and may take a bit of time to adjust to their new environment in your home, but the Bird of Paradise – like all our plants – is strong and adaptable, so take care of it and give it patience and it will reward you with its beauty. The Bird of Paradise thrives in locations with lots of bright light. 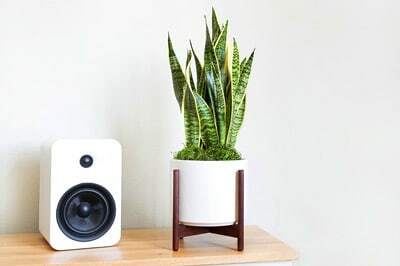 It is also one of few indoor plants that can handle direct sunlight. Water your plant weekly, about 2-3 cups should be good for the Large Bird of Paradise, but it really depends on the humidity and temperature of your space. More light + dry air = more water. Less light + moist air = less water. Avoid cold drafts, and keep temperature between 60 - 75 degrees. It's recommended to keep this plant out of direct reach of pets and children, they may get slightly irritated if ingested. Reach our plant care experts at hello@leonandgeorge.com with any questions about your Bird of Paradise.